In terms of circuit configuration, the linear regulator is a feedback loop circuit, as illustrated in Figure 5, with varying dropout voltage depending on the type of the output transistor employed. Broadly speaking, there are conventional type and LDO type linear regulators. The LDO type can be further classified into three subtypes. The LDO using a bipolar NPN transistor, limited in available types, is capable of accommodating a large current, as high as 10A; it has a dropout voltage of 1V to a little less than 2V, which is high for a LDO type. The LDO based on bipolar PNP transistors have now become predominant among the bipolar LDOs. Initially suffering from the problems of start-up on a rush current and current capability; these LDOs have improved in performance through modifications. 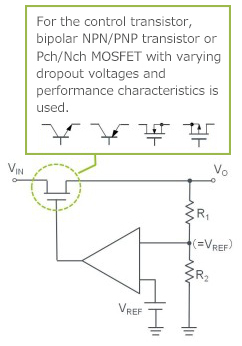 The needs to accommodate further low output voltages and achieve lower power consumption for battery-driven applications have induced the use of MOSFET output transistors. ・Because dropout voltages vary with the type of the (control) transistor used on the output stage , an appropriate transistor should be used to match a specific operating condition.